As we were navigating our way across the Mongolian landscapes across light tracks which often just disappeared..I was reminded of one of my favourite books by Robert Macfarlane called The Old Ways which follows the tracks, drove roads and paths that form an ancient network of routes in the UK. When we reached cross roads or on the tops of mountain passes at points where the road ahead was not clear we would often see a cairn of rocks and sometimes of wood. 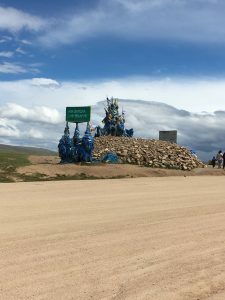 These were called Ovoos and they are sites of worship for travellers to pause and pay their respects to the mountains and offer a prayer to the sky spirit tengri. There would often be blue scarfs tied to the ovoo called a blue khadag which symbolises the open sky. It is a custom for travellers to stop and walk around the ovoo three times in a clockwise direction to help them have a safe journey. 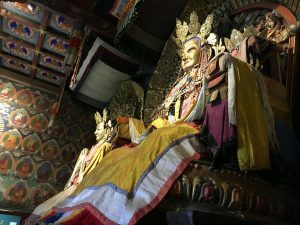 In Mongolia the traditional religion was shamanism which involved worshipping the Blue Sky however, Buddhism became more popular from the 16th century. We visited the Erdene Zuu monastery which is the oldest surviving Buddhist monastery in Mongolia, built in 1585.